In June 2016, Meghan wore J.Crew’s ‘End-on-End’ pyjamas. 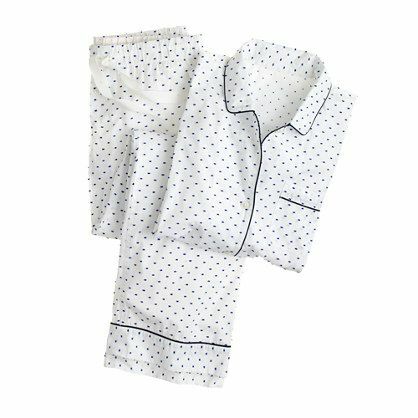 Meghan has the brand’s white pyjamas with blue dots. In June 2016, Meghan wore J.Crew’s ‘End-on-End’ pyjamas. Meghan has the brand’s white pyjamas with blue dots, and the brand also had blue pyjamas with blue dots. No more stealing his pajamas. Our take on the borrowed-from-the-boys classic is designed with an easy fit (read: the comfiest—and chicest—way to get your eight hours) and is sprinkled with sweet swiss dots.